OK so allot of talk about crap getting into open (spoked) coils as well as regular coils.... So what do I use? GOOP this product comes in several varieties (likely all same) and remains pliable while sticking better than most stuff out there. And it is easy to remove as you simply peel up an edge and stretch it off. I use it on my coils and it lasts for many moons before needing redone. Wet your finger when applying to keep it from sticking to you when smoothing over seams between coil and cover for best results. 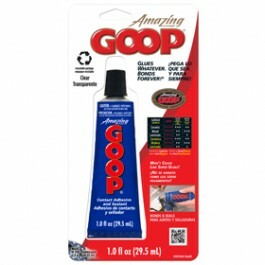 When it first came out it was called "Shoo Goo" but now is simply called "Goop"
OK guys, I'm gonna buy some of that "Goop", and give it to Shep to keep his Dish TV antenna in place. Maybe then I can stay out of trouble !!! Goop over the area that gets worn from all the scraping really works wonders too. Patrick ... Trouble just follows you when with Shep!! That dish sure gets a lot of play time! Say guy's. I have noticed that some coil's are waterproof and some are not. Why would some not be waterproof? If I had a coil that wasn't wp i would do the same thing others have mentioned. I'd spray it with bedliner completely and be done with it. Unless I found a reason to not make it wp. What's ya'll's thought's concerning permanent wp vs. non-permanent wp? Howdy Rimshot, I use the Goop not to waterproof, but to keep very fine particles of dirt and magnetic black sands from getting between the coil and cover as it can cause falsing and stability issues with any detector. As far as waterproof coils go most coin relic coils and some nugget shooting coils are indeed made to be waterproof and often if a coil has open spokes you will find it is also waterproof. To achieve this they are solid "filled inside" or the seams have been sealed specially to be water tight or made of different materials. Many or most of the coils we use for nugget shooting are "water tight" which means they are OK to get wet in rain or other moist conditions, but submersion is not recommended. When submerged sometimes these coils will fail due to water seeping into stressed seams or small cracks from heavy use in the field. In most cases "Water Tight" is fine for nugget shooting since it is rare to find the need to have the coil in or under water. Many of the coils we use are in a very thin hollow plastic shell to keep the weight down and after repeated scrubbing on the ground and banging into rock develop very small cracks and this is why they are not recommended by maker for use in water though some folks do as you say and waterproof the coil themselves. I have used boat epoxy paint on some of my old coils that started to get hairline cracks and it saved one of my old NF fiberglass coils once it dried back out inside after leaking in heavy rain on a trip to NV. It was my favorite on the 3500 and I didn't notice I had cracks in it till it god good and wet. Ok guy's. I was just thinking maybe some of the non-wp coils were built that way so you could replace parts like maybe a new top or a new bottom. Wasn't really sure. My coil bottom cover popped off about a month ago while in the field. Had I not had my rescue strap in my pack, a hunt would have been ruined! I have used Shoe Goo on two coils now. It is stronger and will hold up better than whatever they used at the factory. And, with a knife it cuts away with a little work, not bad. What ever they used at the factory to put the two halves together failed. Shoe Goo will not have that issue. As far as bedliner paint, it would be a really good idea to check to see if there is carbon or another conductive product in the paint prior to spraying it on a coil. It could turn out to be a really bad day! I would be a little concerned about that! It probably is a good idea to check it before you spray it on, but a lot of folks seem to like it ok. I like the idea for 3 reasons. It would do a good job sealing and also help protect the bottom of the coil, plus you wouldn't have to use a coil cover anymore. Look at all the problems Glenn went thru just because a little sand got into his coil cover. lol! But you might want to wait until your warranty runs out before spraying. Here's a google. Seems like most are happy with it. bedliner material from a reputable company (but not most at home applications other than Lizard Skin) will be OK. Most professionally installed products are Kevlar reinforced and don't contain carbon filler. But many will be either too hard and chip off quickly or too soft and drive you crazy by running and punching up. They will all add at least an ounce or two of weight, which feels heavier at the end of the shaft. Not saying don't do it, just know what you're getting in to and don't skimpy on the product. I failed to mention that. I tried the 3m on a tool box and it didn't look anything like the professionally installed bedliner material. Looked more like flat (hammer) paint and real thin too. Even some of the new bedliner installs to me don't look like the installs I seen when the idea first came out for truck beds. The old style looked like it was 1/8" thick. Well i'm glad all the tornados are over....phewwwwww!!!!! Hey John ... Rhino is good until you get snow on it. For that reason I have used Line-X on my last 3 trucks ... 2003 silverado, 2007 silverado and 2011 Sierra. I found early on that loading snowmobiles into the bed of a truck was much safer with Line-X because it doesn't slip when wet ... Rhino under the same conditions because of its smoother finish is like walking on wet ice. I proved that to a number of friends back east and they are now Line-X fans. It is not so much that the machine slides around but when you get off the machine after riding it up into the truck bed and try to walk out the end of the truck. Same when walking into the bed to get the machine off. The Rhino is just plain slippery and asking for a fall. The Line-X somehow tends to grip the snow. I know that isn't much of a problem her in AZ ... at least in most of the state as it isn't a big snowmobile state. I would assume the same for Kali where you live The other thing that convinced me that my choice of Line-X was the right one was that I was carrying a lead acid boat battery in the bed ... forgot about it for a couple days ... somehow it fell over during driving around in those couple days and spilled the acid ... no damage to the Line-X product and a limited amount of under carriage damage where the acid dripped onto frame members from the bed weep holes in the front of the bed. I simply flushed the bed thoroughly, neutralized the remainder with a strong baking soda and water mix brushed on and then one more rinse. Never any damage to the liner and no further damage to the frame. Shortly afterward I took the truck to my Line-X dealer and had him spray the under carriage frame members. End of problem forever. Just my experience ... both are the two roughly equal market share dominant products on the market. Not keen on putting stuff like that on my coils . Just the Real Deal Coil cover filling the gap with Tooth Paste. Goo Is kick but for many things. Sorta like liquid Duck Tape. I think you and I or on the same page. The kind I remember (I think) had a dark brownish color, slightly bumpy, tackey feel to it. Almost like rubber. Kinda like a low profile peanut patty except brownish. Looked more expensive then the stuff I see now days. Good post Bill about sealing the coil cover on with shoe Goop + its easy removal.............Polyurithane window/door UV resistance caulk takes 3 days to dry & is a b**ch to take off ! The other great thing (about goop) is being able to reseal the tube for the next project to. I've had bed liner sprayed on the truck bed, I found it hard, brittle (over time), lacked good adhishan. With wear an tear loading ATVing chunks are missing. Would'nt use it on my coil bottoms as scuff cover. For coil bottom/cover repairs I like to use PC-7 non-metalic 2 part epoxy because it is slicker, sticks better & you can build up worn sections better as needed & THE MOST IMPORTANT REASON IS IT WAS pointed out by some renouned gold prospecters on this forum and others !!!! So, I got the blue package and I gotta say - not a lot of working time. I also learned a significant difference between Goo Gone and Goof Off... Goo Gone is weak and relies on citrus oil. Goof Off is a serious solvent that ate through my nitrile glovest and got the tape goo Off fast! As for spray in bedliners, I can only put my name next to LineX. We looked around and worked with several companies before deciding LineX was the way to go. Not only because of the lifetime warranty and nationwide presence, but also because of the manner by which the dealers get the material and spray methods. Most say companies get their material where ever they can. You're not assured it is what it's supposed to be! LineX requires dealers to buy materials from them, thus ensuring the product quality and they also go through training on install and repair. So you know the guy spraying your stuff has the right materials, tools, and knowledge to do it right. And warranty work is billed back to the shop... so they have an interest in making sure it never fails. What are you using the goof off and goo be gone for Glenn? Nasty stuff but will remove other nasty stuff well. Were you able to find the Household Goop after you called and it has plenty of working time simply lay a bead wet your finger and smooth it on the edge of the coil and you are done. Any mistakes or goop on the fingers easily rubs off before dry. After drying removal is as simple as getting under it with something and grabbing it with fingers and stretching it back off. Hey Bill. I got the blue package. I guess the warmer weather and low humidity had that stuff setting up FAST.. I had barely laid a bead around my 18" and it already had a good skin on it that bunched it up a bit. I had a pail of water right next to me and kept my nitrile glove wet the whole time. I was using goof off to get the glue from the tape off the coils and covers to prep for Goop. Ran over the coils with denatured alcohol to remove as much residue as possible just before running a bead of Goop. Not the prettiest, but coils and spokes are sealed. I did find some more dirt in my cover after our time in the field a week ago. That cap is pervasive!! Hey John ... Just a note for clarity on my post regarding the Rhino product. When I said a smooth finish I am not referring to it being like a window glass but rather a texture like say a naughahide leather substitute BUT the surfaces on the texture are very much a smooth almost glossy surface on the Rhino product as opposed to the rough and dull surfaces of the LineX product. Probably as a camper bottom where snow never hits it ... makes no difference I suspect. But when wet by snow or sleet I'll take the LineX over the Rhino every time from past experience. There is a reason why most auto dealers in snow country back east are switching out of the Rhino and into LineX ... both are readily available in competing markets ... LineX is the product of choice for building contractors and snowmobilers who load their machines into the bed of their trucks. Each to their own I guess ... just my experience as an old Yankee Northern New Englander!